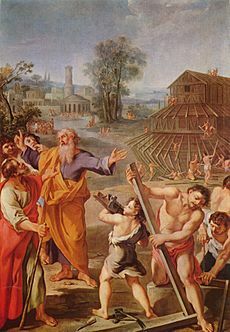 Noah's Ark, according to the book of Genesis (chapters 6–9) in the Bible, was a ship that God instructed Noah to build to save himself, his family, and every kind of animal, because God was going to destroy the Earth by bringing about a great flood. It also says that the ark rested on the highest point in the area which was Mount Ararat, in what is now Turkey. The size of the ship was 300 by 50 by 30 ells, according to Genesis 6:14. This makes it about half the size of the ship RMS Queen Elizabeth 2, or 137 by 22.9, by 13.7 metres. It would have had about the same tonnage (weight) as the RMS Titanic. The ark was 300 cubits long, and 50 cubits wide; the height was 30 cubits. For a long time people did not know exactly how much a cubit was. One day in the later years of the 19th century, archaeologists found a tunnel in Jerusalem. This tunnel had been built in the days of King Hezekiah (around 700 B.C.). At the entrance was an inscription that said the tunnel was 1200 cubits long. The archaeologist measured the tunnel and saw it was 1800 feet long (54,000 centimeters). So now, people know that the Hebrew cubit, at least in the time of King Hezekiah, was 18 inches (45 centimeters). During the Renaissance, a new kind of scholarship arose. These people never questioned the literal truth of the Ark story. They began to think about it from a practical point of view. In the 15th century, Alfonso Tostada told about the logic of the Ark, including things such as arrangements for the getting rid of dung and the circulation of fresh air. The well-known 16th-century geometrician Johannes Buteo worked out the ship's internal dimensions. He also allowed room for Noah's grinding mills and smokeless ovens. Other people also used his model, later on. By the 17th century, America had been discovered and was being explored. This led to new problems. All the species had to be spread again from one point, after the flood. The obvious answer was that man had spread over the continents after the destruction of the Tower of Babel. The different groups took animals with them. Some of the results seemed peculiar, though: why had the natives of North America taken rattlesnakes, but not horses, wondered Sir Thomas Browne in 1646? "How America abounded with Beasts of prey and noxious Animals, yet contained not in that necessary Creature, a Horse, is very strange." Browne was among the first people to question the notion of spontaneous generation. He was a medical doctor and amateur scientist making this observation in passing. Biblical scholars of the time such as Justus Lipsius (1547–1606) and Athanasius Kircher (c.1601–80) were also beginning to look at the Ark story more closely. They tried to reconcile the Biblical account with natural historical knowledge of their time. The resulting hypotheses were important. They were a driving force behind the study of the geographical distribution of plants and animals. They indirectly helped the development of biogeography in the 18th century. Natural historians began to draw connections between climates and the animals and plants adapted to them. One important theory said that the biblical Ararat was striped with different climatic zones. When climate changed, the associated animals moved as well. Eventually they spread to repopulate the globe. There was also the problem of an ever-expanding number of known species: for Kircher and earlier natural historians, there was little problem finding room for all known animal species in the Ark, but by the time John Ray (1627–1705) was working, just several decades after Kircher, their number had increased dramatically. 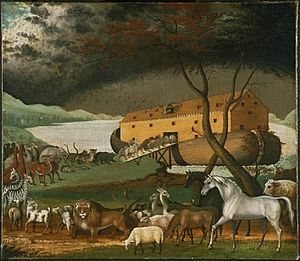 Incorporating the full range of animal diversity into the Ark story was becoming increasingly difficult, and by 1700 few natural historians could see any reasons to believe in a literal interpretation of the Noah's Ark narrative. An artist's depiction of the construction of the Ark, from the Nuremberg Chronicle (1493). Miniature from Hafiz-i Abru's Majma al-tawarikh. Noah's Ark Iran (Afghanistan), Herat; Timur's son Shah Rukh (1405–1447) ordered the historian Hafiz-i Abru to write a continuation of Rashid al-Din's famous history of the world, Jami al-tawarikh. Like the Il-Khanids, the Timurids were concerned with legitimizing their right to rule, and Hafiz-i Abru's A Collection of Histories covers a period that included the time of Shah Rukh himself. Noah's Ark Facts for Kids. Kiddle Encyclopedia. This page was last modified on 13 April 2019, at 04:04.